If you need affordable, convenient Turnersville auto glass replacement, Clear Vision is your answer. Our mobile technicians can repair or replace your auto glass wherever you are in Turnersville and Gloucester County. We are ready 24/7 in emergencies, and we can get you on the road safely again. Fixing Cracks and Chips. If you have a crack or chip in your windshield that is smaller than a quarter, you should arrange to have it fixed. It could grow larger and result in a more expensive windshield replacement. We can send one of our technicians out to repair the chip, saving you potential future costs. Replacing Windshields. For windshields that are cracked or shattered beyond repair, we can bring out a brand new one and install it. We carry original glass or less expensive aftermarket equivalent glass, which is equally safe and functional. 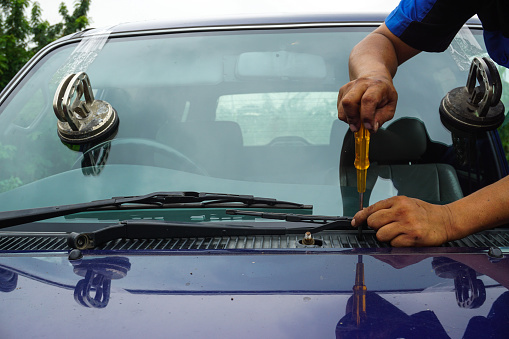 Our trained techs can install windshields for most every type of vehicle. Mirror Replacement. You take a huge risk with a shattered rear view mirror. Taking one’s eyes off the road to check blind spots is a common cause of highway accidents. If you own a commercial vehicle, it’s unsightly and can be illegal as well. We can replace your mirror, even if it’s a power mirror, and restore your safety and peace of mind. Power Window Replacement. If you’re stuck and need a new power window installed, contact us and tell us what type of vehicle you’re driving. Our technicians will bring the correct parts and completely replace your window, addressing any motor problems as needed. We’ll fix your window and clean any shattered glass from your interior, all for much less than a dealership would charge. Don’t take chances with being able to see clearly while driving. Call on us for your Turnersville auto glass replacement today or use this form to request a quote. Clear Vision is here to help you drive safely and legally again.